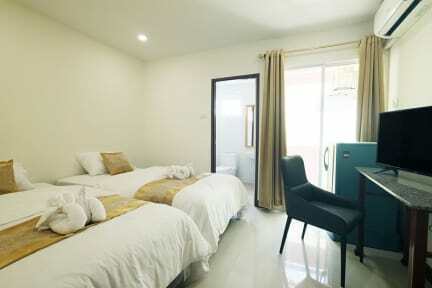 When visiting Pattaya, you'll feel right at home at Happy Hostel, which offers quality accommodation and great service. The excitement of the city center is only 3.6 km away. Visitors to the hotel can take pleasure in touring the city's top attractions. Happy Hostel offers impeccable service and all the essential amenities to invigorate travelers. A selection of top-class facilities such as free Wi-Fi in all rooms, daily housekeeping, taxi service, tour information service can be enjoyed at the hotel. The location is near to the city centre and it just takes about 10-15mins to get to pattaya beach. The room has strong air conditioning and the bed is so comfortable and decent. There are medium-size clean bathroom as well.